Solution: Ortho-dichlorobenzene, C6H4Cl2, is obtained when two of the adjacent hydrogen atoms in benzene are replaced with Cl atoms. A skeleton of the molecule is shown here. Complete a Lewis structure for the molecule using bonds and electron pairs as needed. 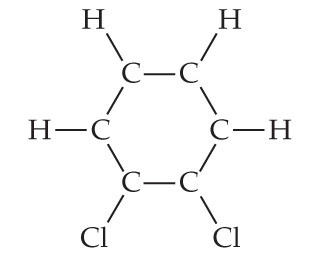 Ortho-dichlorobenzene, C6H4Cl2, is obtained when two of the adjacent hydrogen atoms in benzene are replaced with Cl atoms. A skeleton of the molecule is shown here. Complete a Lewis structure for the molecule using bonds and electron pairs as needed.